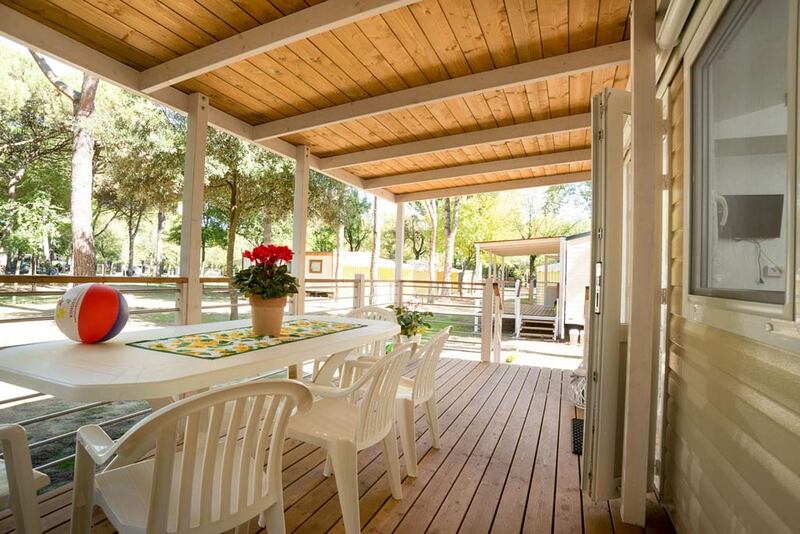 CHALET DEL SOLE 34 + 15 SQ. 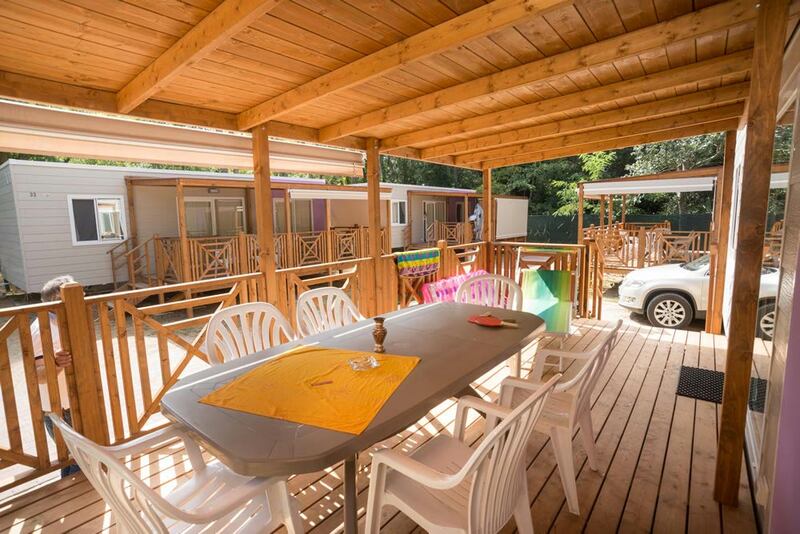 M.
Chalets “Sole” (The Sun) are large accommodation units are large houses, of 34 square meters, plus 15 square meters of raised wooden veranda, equipped with table and chairs. 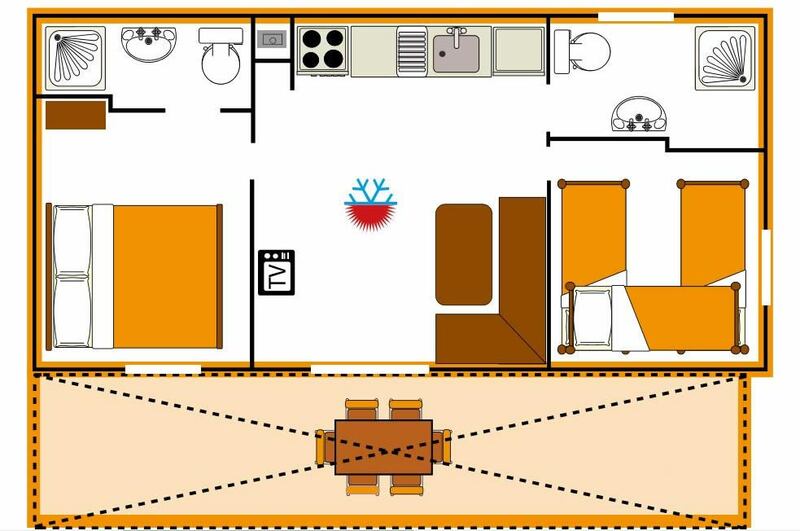 The interior is structured with 2 bedrooms, living room with kitchenette, bathroom, car parking, air conditioning (hot / cold), TV with satellite channels, a safe-box, a lounge chair, a sun bed and a beach umbrella in the living unit. The kitchenette includes a gas cooker, microwave, 200-liters fridge with freezer, sink with hot and cold water, pots and pans. 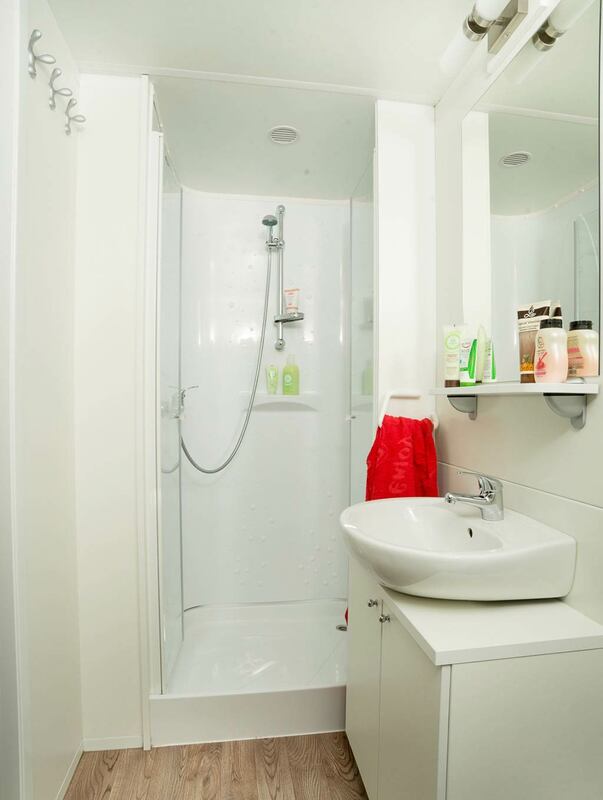 The bathroom has a sink, a toilet, a bidet, a shower and a hairdryer. 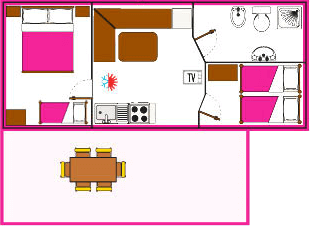 In the first room there is a double bed and a single bed, and in the second bedroom there are 2 single beds. A sixth person can sleep in the pull-out bed in the kitchen. Pillows and blankets are provided, linen and towels are excluded. A bicycle is included in the price. Chalets “Sole” are equipped with an integrated quality – environment management system - environment, according to the international standards ISO 9001 and ISO 14001, with the use of selected material and focused on energy saving and with the least possible environmental impact. The final cleaning has be carried out by the client or costs € 50,00. 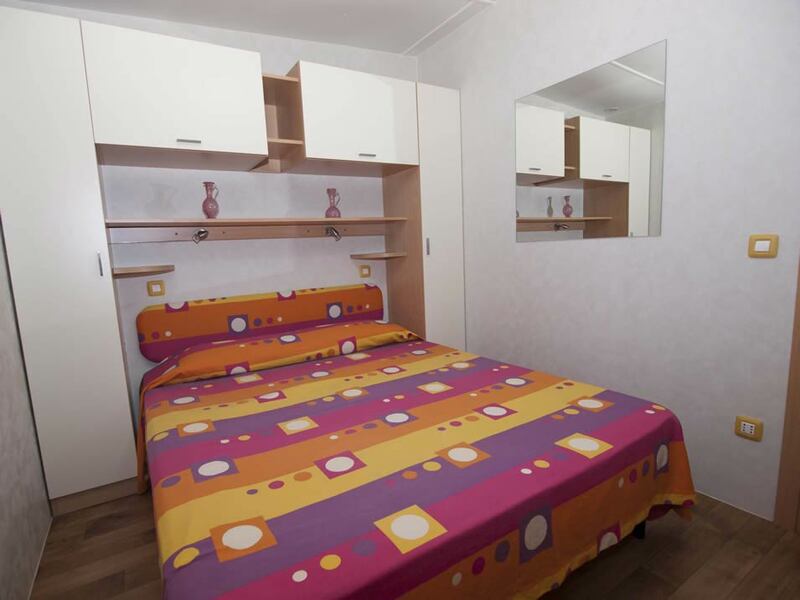 CHALET LAVANDA 34 + 15 SQ. M.
Chalets “Lavanda” (Lavender) can accommodate up to 6 + 1 persons. 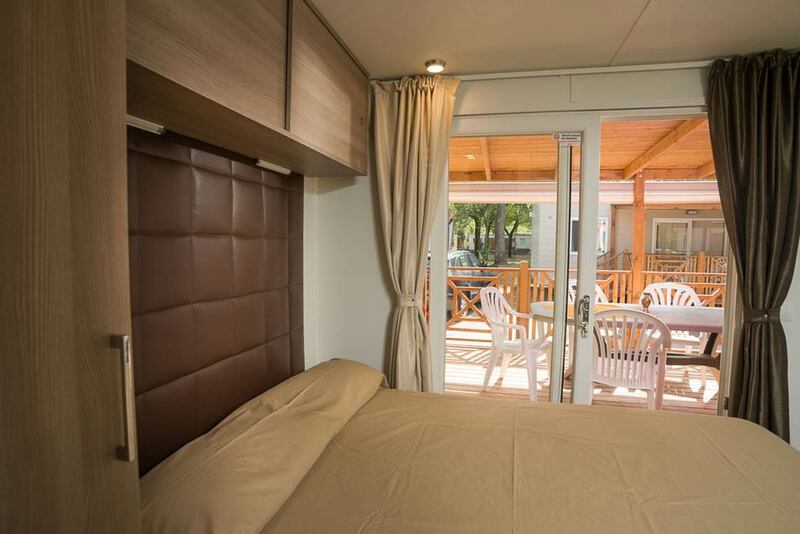 They are ideal for those looking for a tourist resort in Jesolo with cozy and spacious accommodation units, the best to accommodate large families. 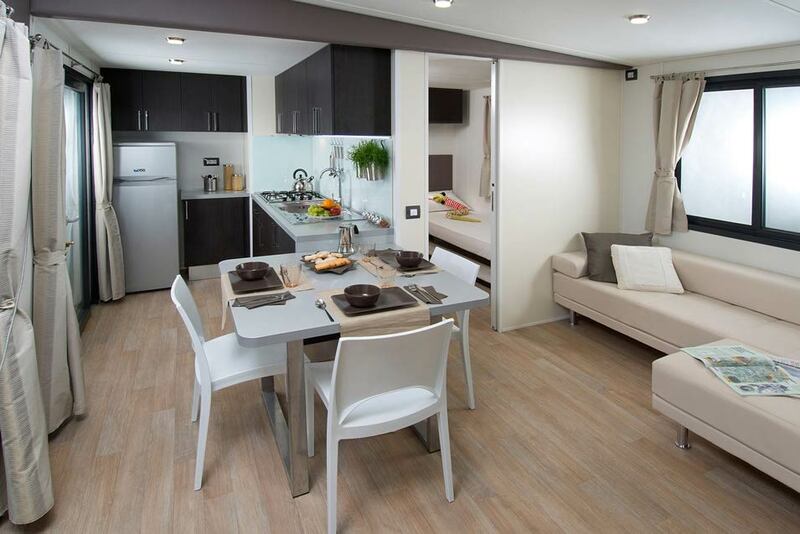 They size of units is 34 square meters, plus 15 square meters of raised wooden veranda, equipped with table and chairs. Inside it is structured with 3 bedrooms: one double and 2 rooms with two single beds respectively. Another bed post can be obtained from the couch in the kitchen. The services include the air conditioner with cooling and heating, satellite TV, safe-box, parking place, WI-FI and a bicycle. 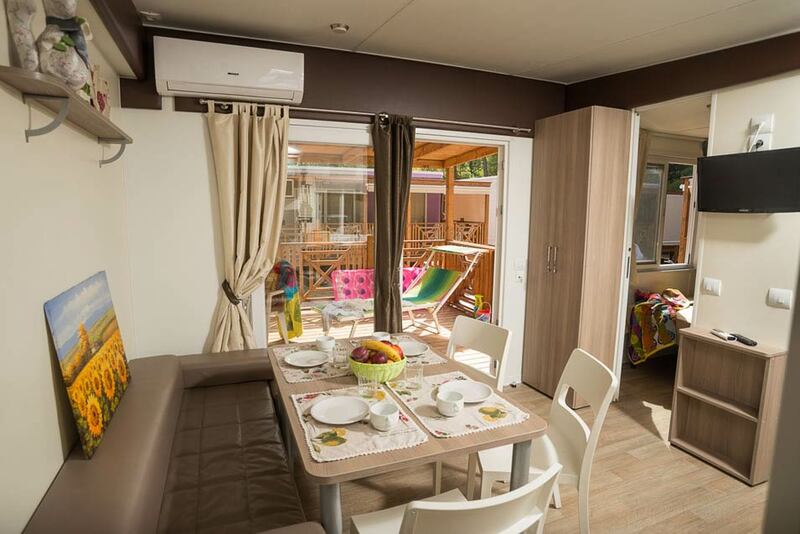 The living area has a living room with kitchenette, equipped with a 200-liters fridge with freezer, microwave, sink with hot and cold water, pots and pans. 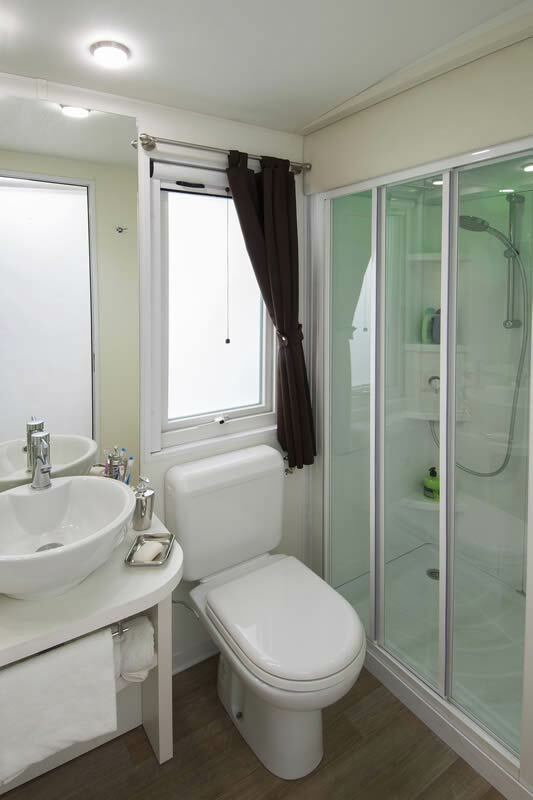 The unit also includes 2 bathrooms, each with shower, toilet and sink. Furthermore, in the living unit there are a deck chair, a sun bed, a beach umbrella. Pillows and blankets are provided, linen and towels are excluded. 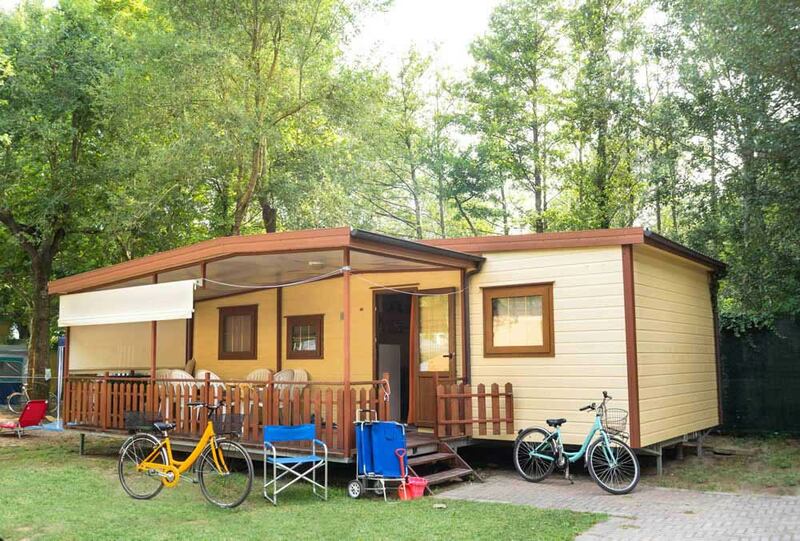 Chalets “Lavanda” are equipped with an integrated quality – environment management system - environment, according to the international standards ISO 9001 and ISO 14001, with the use of selected material and focused on energy saving and with the least possible environmental impact. 30 + 14 SQ. 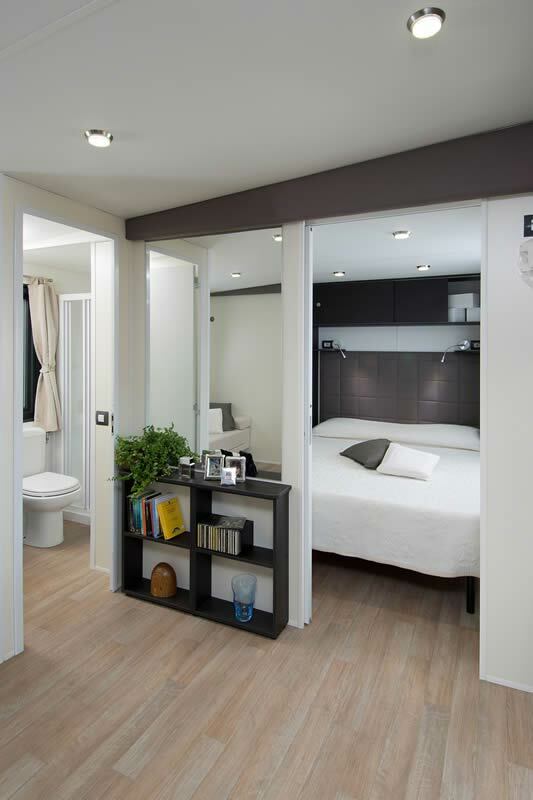 M.
Another interesting type of housing unit suitable to host 5 + 1 persons are the chalets “Giglio” (Lily). Their size is 30 square meters, plus 16 square meters of raised wooden veranda, equipped with table and chairs. 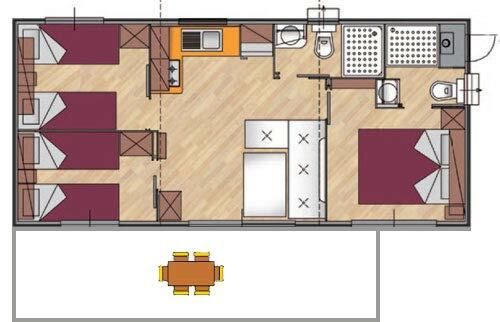 This model offers a spacious accommodation, it has master bedroom with double bed and wardrobe, plus a second bedroom with two single beds and a third raised bed (190 X 70), another sleeping place can be obtained from the pull-out bed in the kitchen. 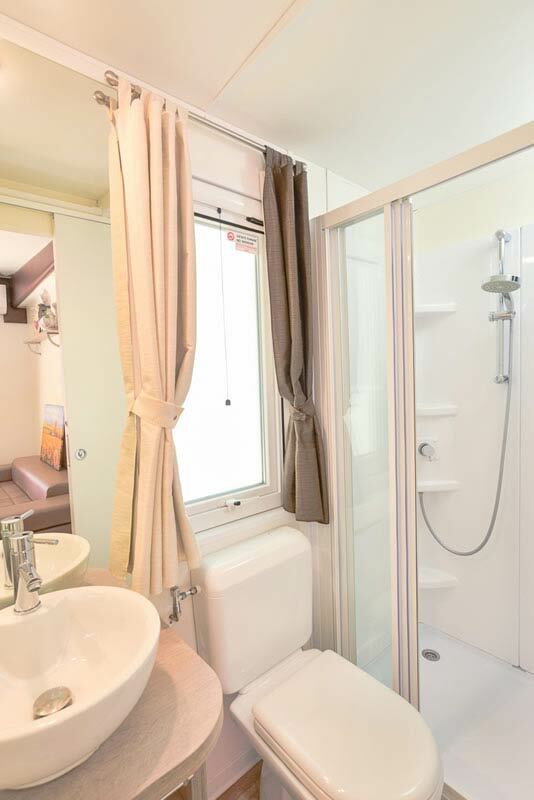 It has two bathrooms each with shower, toilet and sink. 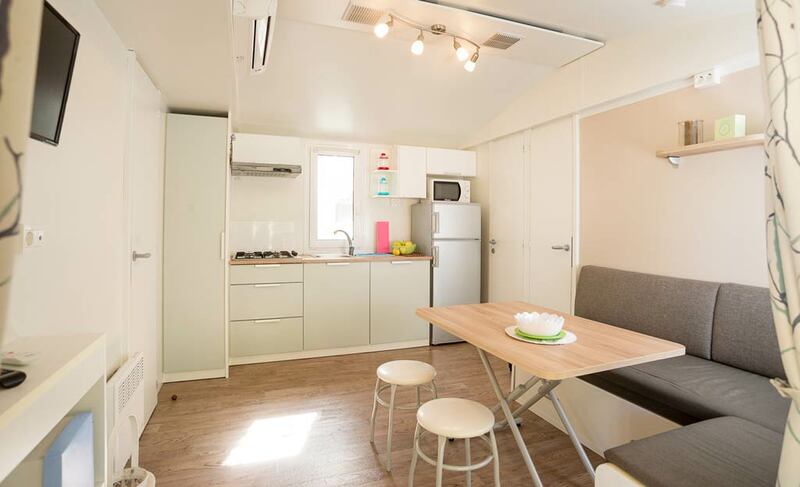 The living area has a living room and a kitchenette, equipped with 20-liter fridge 200 with freezer, microwave, sink with hot and cold water, pots and pans. Services include air-conditioning (heating / cooling), safe-box, satellite TV, parking place. 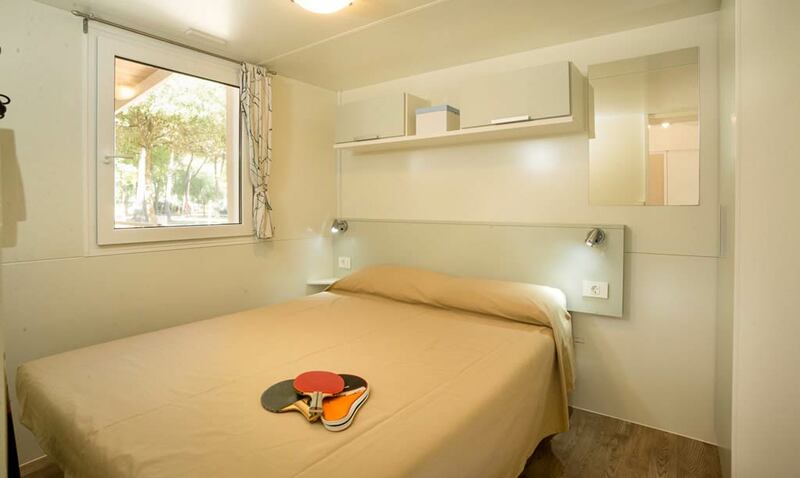 This accommodation unit also has a deck chair, a sun bed and a beach umbrella. 31 + 15 SQ. 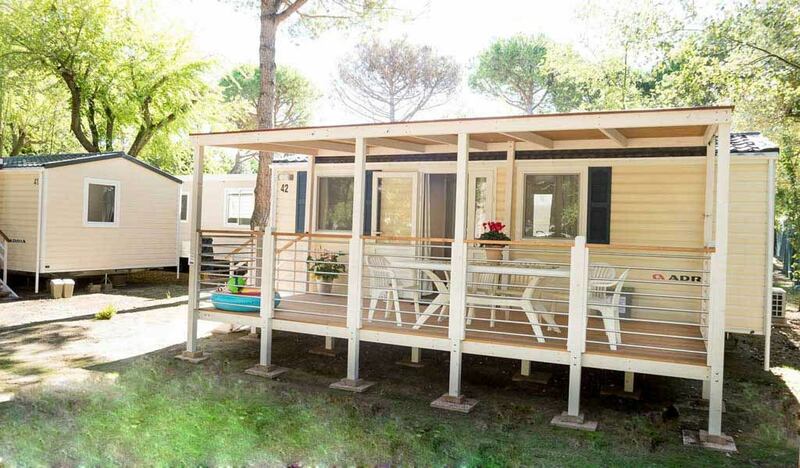 M.
If you are looking for a campsite for families in Cavallino choose the new Chalet Genziana accommodation type at Camping Village del Sole. 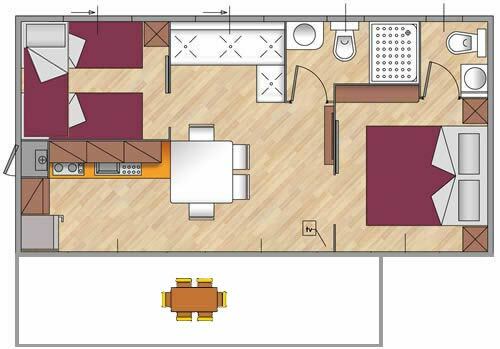 The size of the chalet is 31sq.m., plus 15 sq. m. of raised wooden veranda, equipped with table and chairs. This chalet is ideal to accommodate 5 + 1 people and offers a comfortable atmosphere, featuring a bedroom with double bed and wardrobes, plus a second bedroom with two single beds and a third raised bed. 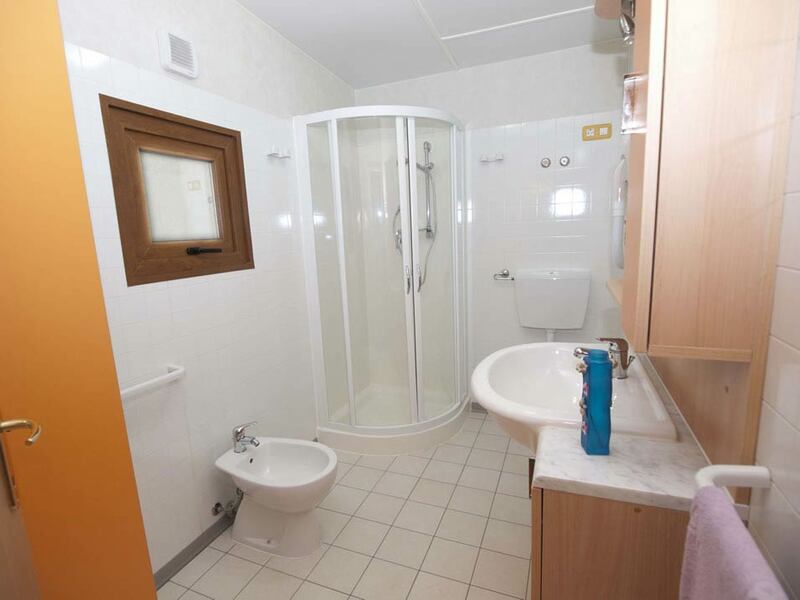 There are two bathrooms, one with shower, toilet and sink and the other with toilet and sink. The living area has a lot of light because two large doors connect it with the spacious raised outdoor wooden veranda creating a cozy atmosphere, in direct contact with nature. 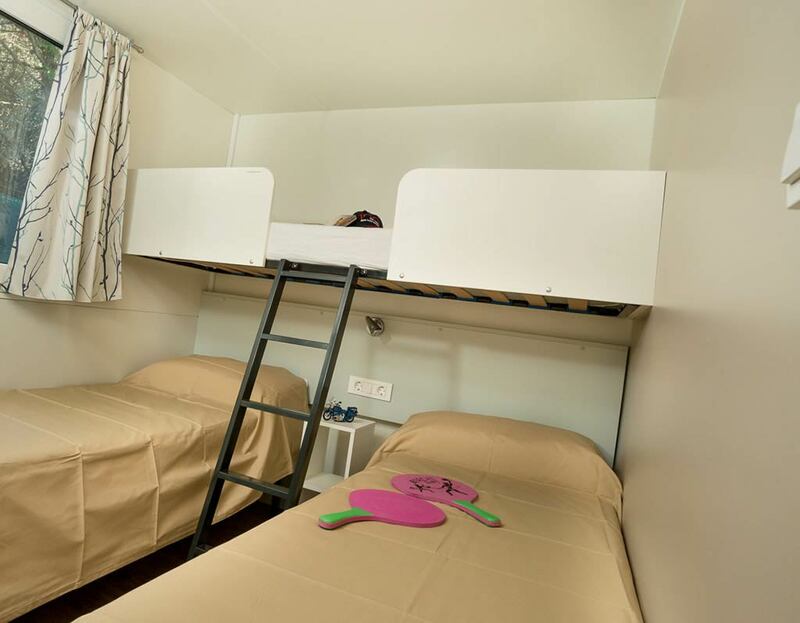 The living room and the kitchenette, are equipped with a 200-liter fridge 200 with freezer, microwave, sink with hot and cold water, pots and pans. Services include air-conditioning (heating / cooling), safe-box, satellite TV, parking place.